Bring the fall season to your home, classroom, or studio! Our leaves are turning yellow and orange. The temperatures are dropping. The apples and pears are ready to be picked. The squirrels and chipmunks are dashing around, collecting acorns. The pumpkins are filling the open fields with bright spots of orange. There’s talk of Halloween costumes. We are reading fall books at bedtime. Fall is definitely here! 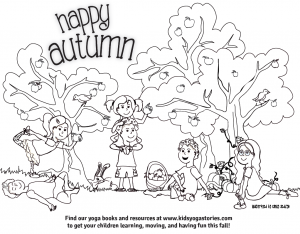 Explore the fall season by having discussions, reading books, and doing related kids’ activities and art projects. Take the learning further by using breathing techniques and yoga poses. Brain research shows that adding movement to the children’s learning experience stimulates their thinking, ultimately making learning more fun and effective. The “FALL” FOCUS BREATH is flying bird breath. Practicing the flying bird breath is a great opportunity to combine breath and movement. Children use their bodies to pretend to fly like a bird and sync their breaths with the movement. To practice flying bird breath, come to standing comfortably in Mountain Pose. Close your eyes, if that feels comfortable, or gaze gently down in front of you. Take a few deep breaths to calm your mind and body. Come to the present moment. Breathe in and out through your nose with your mouth closed. Imagine being a bird flying through the sky. On your next inhale, lift your arms over your head, touching your palms together. Then on an exhale, bring your arms back down to your sides, touching your palms to your outer thighs. Continue this flow for a few minutes: arms up as you inhale, arms down as you exhale. Then, when you are ready, come back to Mountain Pose, open your eyes, and breathe naturally. This breathing technique can be found in the Yoga 4 Classrooms card deck. The “FALL” FOCUS YOGA POSE is Warrior 3 Pose. Start by standing tall in Mountain Pose. Then shift your weight to stand on one leg. On an inhale, slowly bend your torso forward and squeeze your shoulder blades together while extending your arms and the other leg behind you. Gaze at the floor in front of your foot. Flex your foot so that your toes are pointing at the ground. Elongate your neck and straighten your spine so that a straight line runs from your head to your foot. Ensure that your hips are parallel to the ground. Take your arms out to the side and imagine you are a bird flying through the sky. You can also try flapping your “wings” (your arms). Come out of the pose on an exhale, lowering your leg to the ground. Take a few deep breaths. Switch sides and repeat the steps. 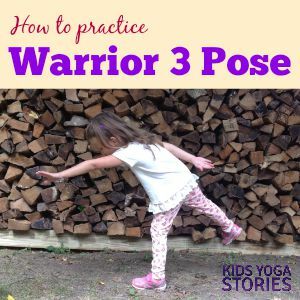 The “FALL” FOCUS YOGA FLOW is Warrior 3 Pose, Squat Pose, and Child’s Pose. 1. WARRIOR 3 POSE – pretend to be a bird flying south for the winter. take your arms out to the side, and flap your arms like a bird’s wings. 2. SQUAT POSE – pretend to be a squirrel collecting acorns. 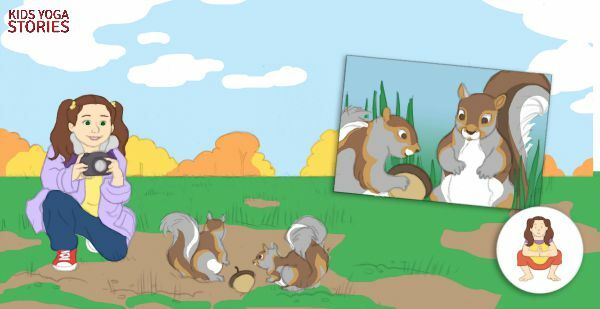 Come down to a squat and pretend to collect acorns like a squirrel. 3. 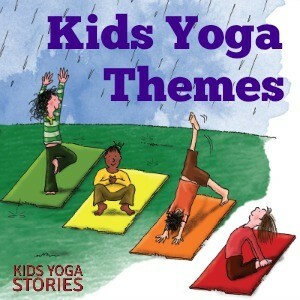 CHILD’S POSE – pretend to be a pumpkin in a pumpkin patch. alongside your body, and take a few deep breaths. Imagine you are a pumpkin in the field. You can flow gently over and over through these three poses. 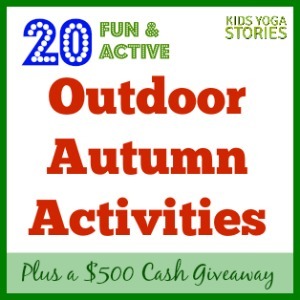 Talk to your children about what else you might see or do during the fall months. 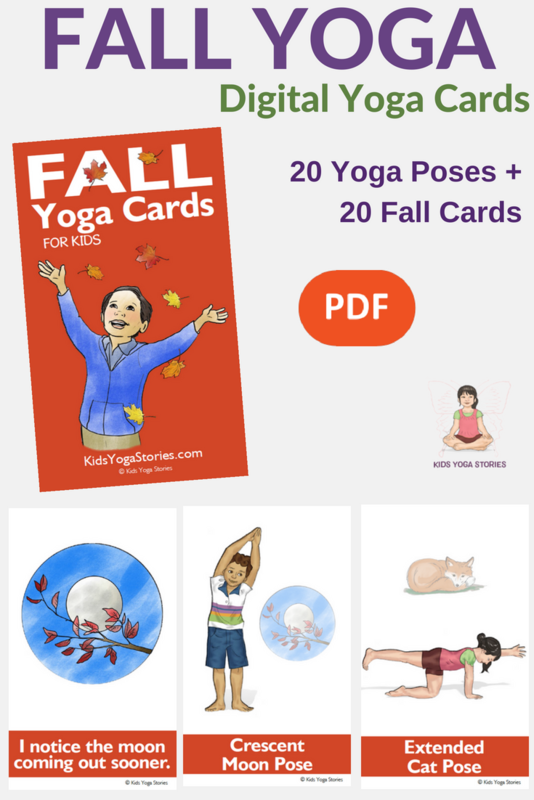 Invent your own fall yoga poses or check out our Yoga Poses for Kids page for inspiration. 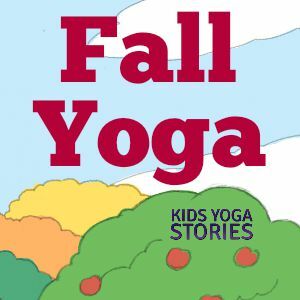 Throughout the month, you could use these three autumn-inspired yoga poses as a base and add other autumn yoga poses or breathing techniques to extend the children’s learning. Follow their interests and needs. 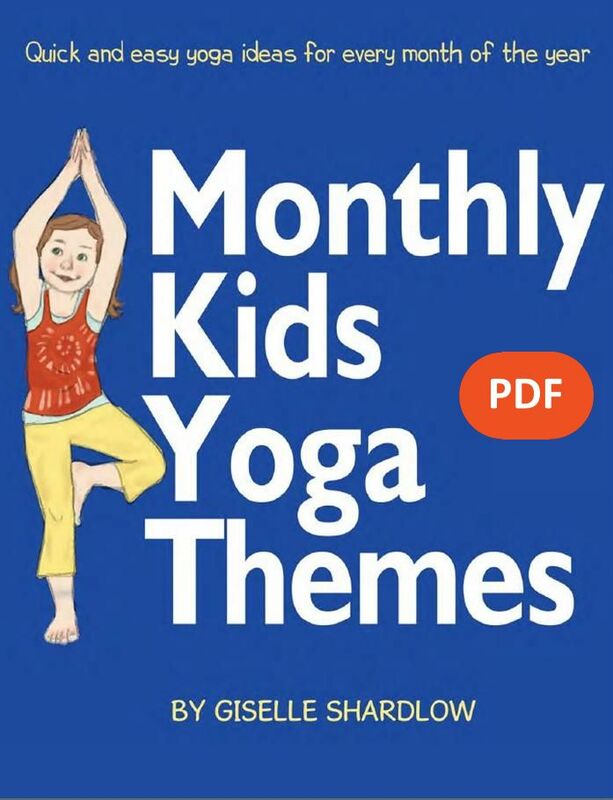 You will know if their yoga experience should be more calming or if they need something more dynamic and active to help release their pent-up energy. 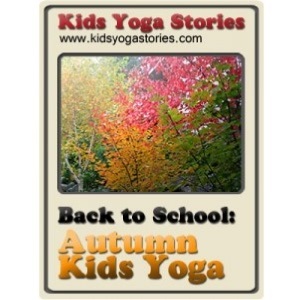 Check out our other autumn yoga sequences listed below, as well. 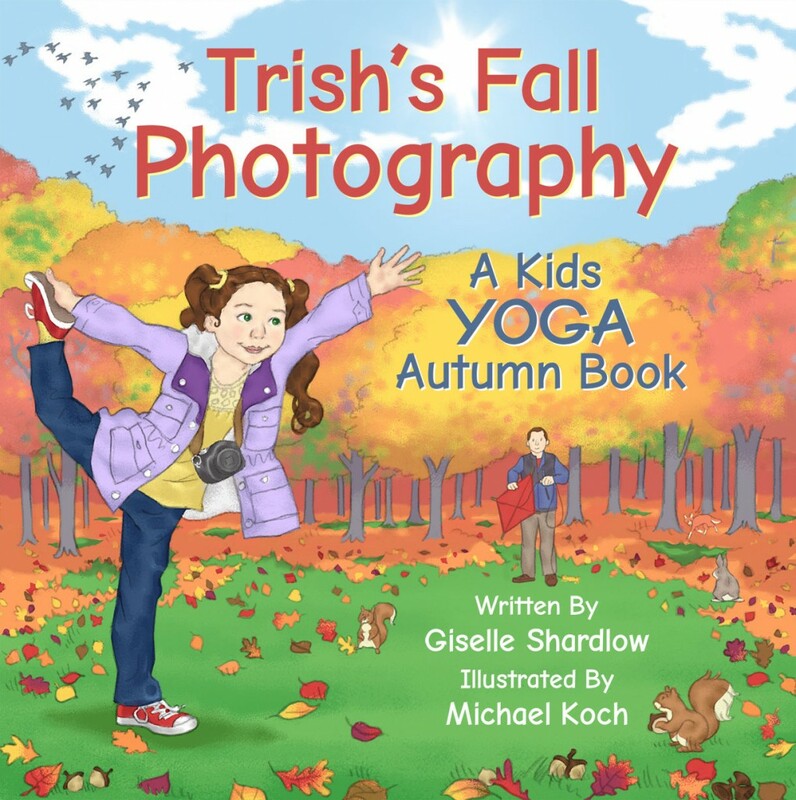 The “AUTUMN” FOCUS YOGA BOOK is Trish’s Fall Photography. Trish’s Fall Photography was inspired by our new home in New England, a place where people from all the world travel to visit during the fall season to see the colorful trees, pick apples, attend fall festivals, and eat apple cider donuts. 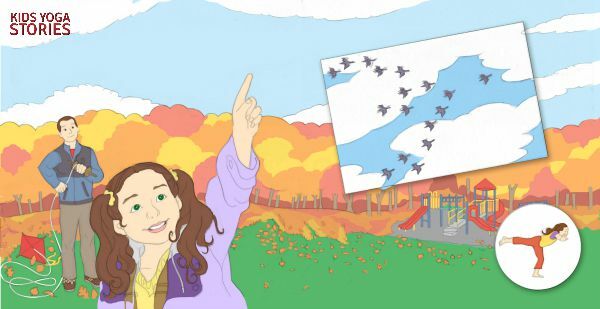 This story follows a girl named Trish and her father as they travel around their local neighborhood, taking pictures of the signs of fall. 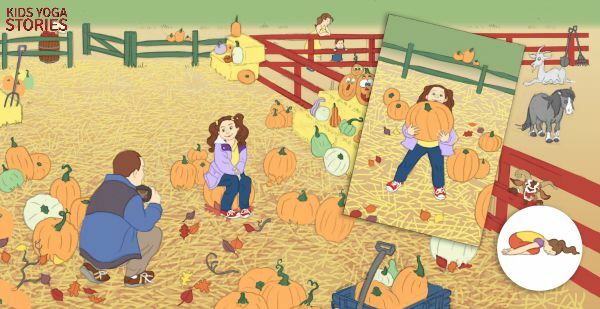 Readers will act like a tree, kite, and pumpkin as they learn about the fall season. 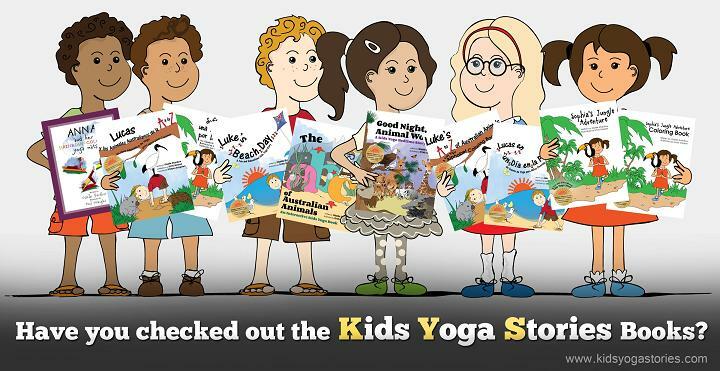 Kids Yoga Stories newsletter by adding your email address to the box at the top of the page.